Axel Kühn, 35 Years old, is based in Munich, Germany. He started playing flute at the age of 6 and changed to Tenorsaxophone during schooldays playing with the local School-BigBand and small groups. 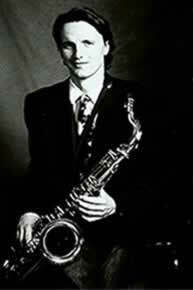 He studied saxophone at Musikhochschule Graz/Austria and obtained further studies with Jürgen Seefelder in Munich. He made his start in the scene joining the Harald Rüschenbaum Sax&Brass BigBand. (You can hear him on the record "Rondo" H.R. Big Band). He`s got a wide variety of musical interest from jazz to R & B and latin music. Axel also played with german stars like Udo Lindenberg and Konstantin Wecker. In 1993 he recorded his first CD with trumpet-player Claus Reichstaller "Conception" which is followed by the latest record "Conception Live" (recorded 1998). He worked for many Radiostations like: BR, SWR, HR, NDR, ZDF Jazzclub; performed with the SWR BigBand, Thilo Wolf BigBand, Bamberg Symphony BigBand, Bobby Burgess BigBand.